I was first introduced to cloth pads by Jam during mid of last year. My initial reactions were EEKKK & GROSS! Read the first comment on that post and you will know how I felt at that time. The thing is I don’t wash my underwear hehe… that’s why I feel URGGHH reading that post. While Jam post has instill me the awareness of cloth pads, it was Dawn’s post on trying out cloth pads that prompted me to make ‘the’ move. However it took me a year later to gather up the courage to embark on the cloth pads journey (because I still feel EEEK during that 1 year time hahaha). My plan was to try out a couple of cloth pads and see how it goes. That was back in July this year. 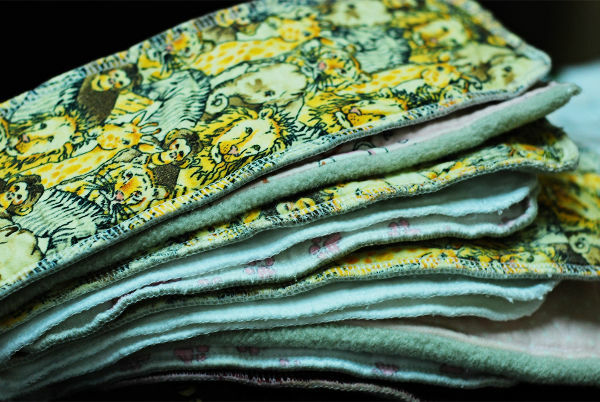 I ordered a bundle with 9 pieces in total ranging from light to heavy flow cloth pads from New Moon Pads. And I received it just in time for my monthly ‘best friend’. Thank you so much Renee. I can’t tell you how amazed I am by the absorbency level. And the best thing is no smell at all. It is very refreshing and comfortable too. I decide there’s no turning back to sanitary pads. Boo hoo to sanitary pads. However I have leakage problem at both side of my underwear during the high flow & night time. So I ordered 2 ultra absorbency cloth pads again from Renee (taking advantage of the free shipping promotion hehe). Oh and my mom would not let me use the washing machine. But I’m going to let her let me wash my cloth pads with the machine someday. I’m using more water with hand washing you see. And because of the high absorbency, I basically don’t need to change while I’m on the road. And if I do, I bring a small ziploc bag to keep the used cloth pad. Simple & easy. Just the other day I injured my finger and as a result I couldn’t wash the cloth pads. So I revert to sanitary pad temporary (just 1 day). The uncomfortable feeling is so major. I felt like puking for using sanitary pad. Ewwwww to the yucky smell!!! 1. I can’t bear the sickening smell of sanitary pads any longer. They stinks! 2. I hate the stickiness & non-breathable feeling at the ‘bottom’. 3. Save the environment!!! *a sanitary pad takes approximately 500 years to biodegrade partially!!! 1. Take a pack of your sanitary pads and try to look for the ingredients used. NONE right? Isn’t that scary? We’ve no idea what ingredients/chemicals are used. 2. The intoxicating smell that I thought were blood is actually chemical smell. The price of cloth pads may be on the high side but in the long run you’re actually saving more money because you don’t have to buy new cloth pads every month or year. Unless of course you’re looking for new pattern & design. For myself, I’m happy with what I have currently but I will order new cloth pads from other shops to try out. So yes, I LOVE LOVE LOVE CLOTH PADS!!! This is not a sponsored post. This is an awareness post with the hope of helping women & saving our earth for a better tomorrow. I hope this post will change your view on using cloth pads. Try it yourself and I guarantee you will not look back at sanitary pads anymore. p/s: I’ve not figured out how to wash cloth pads during traveling. Hmm how ar? Bring a pail? Any idea? Yeh!! Congrats, girl! Yes, I will never go back to disposables anymore. yeah, and thanks for the link up! I brought along my cloth pads on my vacation, but then, my body clock went haywire. No period for the whole month. If I could use the pads while on vacation, I would rinse them off and soak in the sink. wash the sink off and then soak, wash and wash the sink off again. that was my intentions. Tekkaus, recommend cloth pads to your wifey ya. ahhh!!! this is the thing that i have been researching for months and still havent got the guts tot try. REALLY not gross washing it?